KATIE: Watch and learn, Waffles. Watch and learn. THIS is how you get treats. WAFFLES: Uh, Boss? What's with the skirt? KATIE: It's not a skirt, it's a tutu. WAFFLES: Wait, treats? You man all I have to do to get treats is wear a skirt? WAFFLES: If I wear a four-four will I get even more more? KATIE: The treats have nothing to do with the tutu, Waffles. It's all about grace, elegance...and standing up on your toes, looking pretty. You know, like twinkle toes. WAFFLES: I can twinkle. I can go number tutu too. KATIE: Please, just ignore him. Congratulations to Rhonda P. and Sharla from BeadedTail! They are the lucky winners of our Triple T Studios Jewlery giveaway. Thanks so much to everyone who entered and to Joanne from Triple T Studios for providing the prizes! You can see more of the beautiful Feline Finesse collection on our blog post HERE. Katie you belong in the Americat Ballet. Congrats to the lucky winners. We NEED to see Waffles in a four-four. It would make Mommy's week. Hang on WAFFLES IN A TUTU times two? We'd love to see you in a tutu Waffles and see if you're as graceful at Katie. Congrats to the winners! Katie, you are sooooo graceful! Waffles, will you dance for us next? OMC, every time I think I've heard it all from Waffles, he comes up with something new! Concatulations to Sharla - my human (and I) have one of their necklaces and it is so lovely and sparkly! pee ess...congrats to the winners! Even Brulee will get up on her toesies for treats! 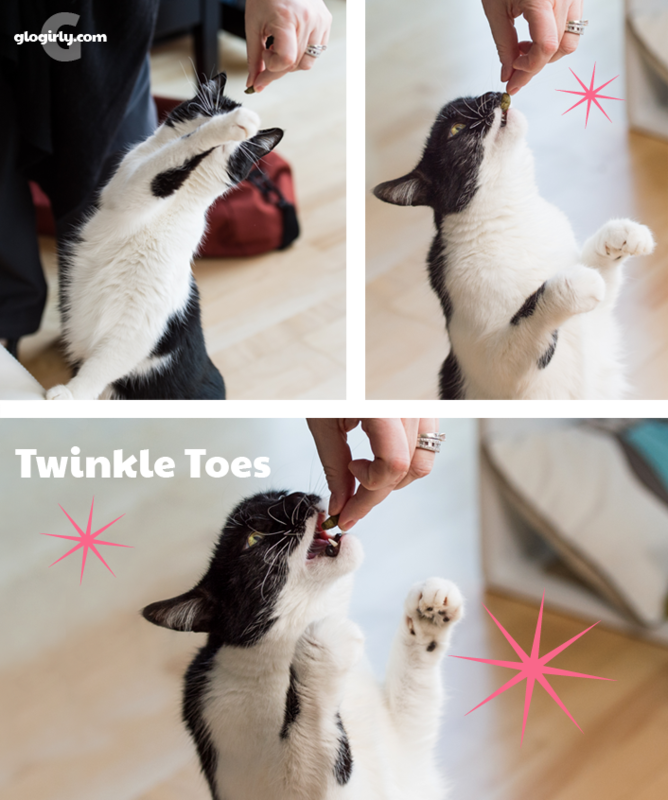 Katie, you look very cute being twinkle toes! And Waffs, we would love to see you in a tutu or a fourfour. Meowm loves her prize. She picked the earrings and they are adorable! Thanks for running contests for all of us! You are quite graceful Katie! You definitely deserve a few nice treats for that :) Keep trying Waffles! You are so cute that there has to be something treat-worthy that you can do too. Try on that four four and see if it works! Katie you rocked the tutu like nobody else! 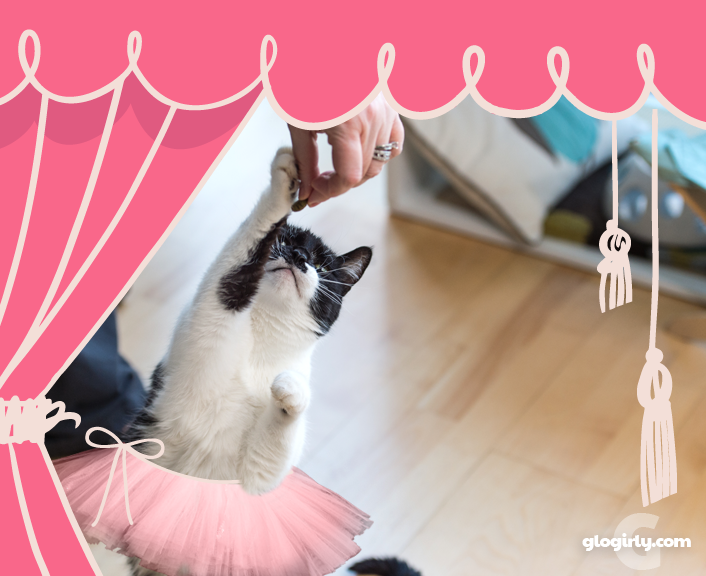 We also wanted to congratulate you, Waffles and Glogirly for your Best Cat Blog nomination on The Nose to Nose awards. We are always looking for to your funny shenanigans. Waffles certainly can twinkle! He looks like the Maneki Neko - lucky cat - in that pose. Katie is graceful and lovely as ever. You guys look very sweet standing cup for your treats. The tutu is priceless, Katie. Aaaaaaw Y'all look so adowable. Yous tutu is very cute Katie. And whatever tweats yous havin' sure must be pawsum. Hav a wunnewful day. 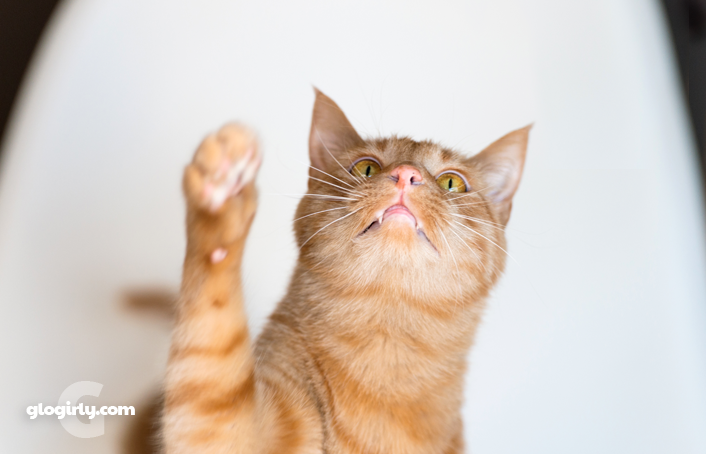 Dance, lovely kitties, dance for your treats! Katie, you really have a smart brother. A four four??? How can you stand it????????????? Mommy laughed and laughed and all I can say is, I'm so sorry you have a little brother. I stand with Waffles. If wearing a tutu gets you a treat, wearing a four four ought to double the fun! If I offer treats by hand I have to make sure nails are trimmed close, or I often get one stuck in my hand..
You are the most gorgeous ballerina ever, Katie!!! Derby used to dance for his treats. Me, NO WAY. I just want them! Love the tutu but I would have paid to see Waff wearing it. HAH! After Pop’s back surgery, his hospital roommate had two broken feet that he got trying to jump from one building to another in NYC so Pop called him Twinke Toes. Faraday: Waitaminit. KATIE gets TREATS just for going Number Tutu?? Can I come live with YOU? I'd get TONS of treats! I would like to see you in a tutu Waffles, wearing one of your wigs too of course. Concats to the winner of the jewellery.